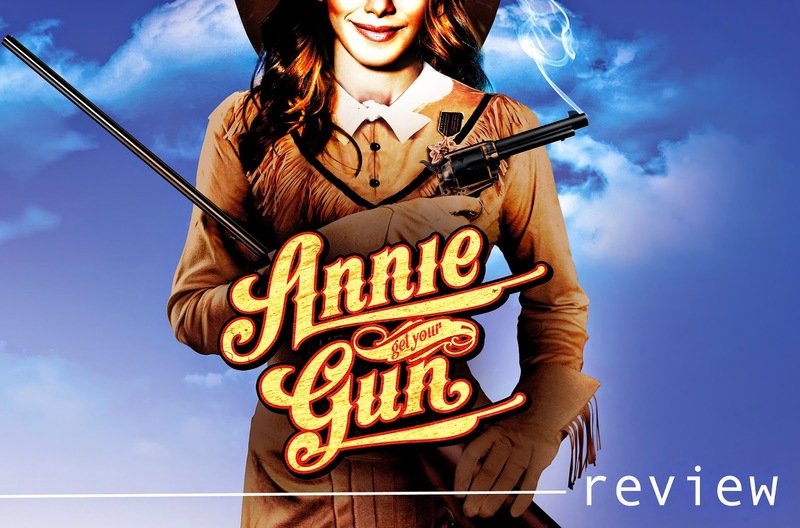 The Ambassador Theatre Group have once more dipped into the barrel of great classic musicals this year to lovingly resurrect Irving Berlin’s Annie Get Your Gun, based on the original film and stage musical depicting the (fictionalised) life and times of legendary real-life sharpshooter Annie Oakley. It’s from a creed and calibre of musicals that many will still herald as a ‘golden era’ of sorts, that still-adored pocket of the 1950’s and early 60‘s in particular where the likes of Berlin, Rodgers and Hammerstein and co were a major force in Hollywood and Broadway, and were irreversibly shaping and defining the musical genre as a whole. Plucked from amongst the Carousel’s, South Pacific’s, Singin’ in the Rain’s and Berlin’s own output, Annie Get Your Gun has been revisited in 2014 with little-to-no alterations to character, plot or music, meaning the entire show is dripping in welcome nostalgia, has inherited a handful of quite iconic signature numbers within the medium, but also chugs along with so many of the old-fashioned narrative tropes and cliches that it may prove a trifle too twee or outdated for younger audiences in particular. For existing fans of the film or show, this is a faithful, honest-to-goodness revival that should tick most of the required boxes and expectations going in, plus there will be very few who can resist a good sing or toe-tap along to the likes of ‘There’s No Business Like Show Business’ and ‘You Can’t Get a Man With a Gun’. 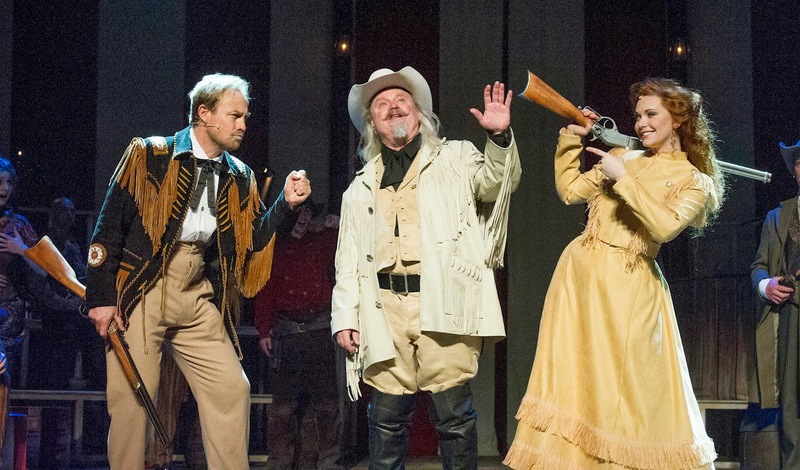 The show centres around Buffalo Bill’s Wild West traveling show as it recruits talented young sharpshooter Annie Oakley (Emma Williams) after their star shooter, Frank Butler (Jason Donovan) challenges her to a shooting match and loses. Besting Butler, but yearning for his affection, Oakley quickly becomes an equally prolific and successful star of the show, and both the romantic and competitive streaks up an ante. As mentioned, it’s suitably atypical stuff, and some of the supporting storylines, particularly a secondary, somewhat star-crossed romance between two of the show’s talent (nevertheless played earnestly by Lorna Want and Yiftach Mizrahi) is filler of the most ephemeral and perfunctory variety. Still, it resonates plenty of old-fashioned charm and is perfectly enjoyable in that pleasant, inoffensive, Ye-Olde-Musical kind of way. It has to be noted though that a lot of the production feels strangely muted and subdued. Bar Williams’ central performance (more on which later), this is a show which, despite it’s showy premise and location setting of the Wild West, being all big tops and brassy show business, fails to ignite or energise itself in the way recent revivals or adaptations of classics such as Singin’ in the Rain, Top Hat and even Seven Brides for Seven Brothers have done so. It’s bizarre and borderline inexplicable, particularly seeing as in terms of aesthetics and visual design the show is quite a sumptuous offering, with some particularly gorgeous and colourful costumes, set design and lightning in particular. It occasionally comes to life, briefly showing glimpses of it’s full potential in sequences such as ‘I’ve Got the Sun in the Morning’, and of course ‘Anything You Can Do’ remains as crowd-pleasing as ever, but generally this is a show which trundles along without any real fire in it’s belly or particular flare in it’s execution. Unfortunately, a great deal of the blame for this seems to lie at the feet of Jason Donovan, whose performance as womanising, smooth-talking Frank Butler is so deflated and outside of his comfort zone that he comes across as horribly miscast. It’s a pity, given the great things we said about his performance in Priscilla: Queen of the Desert last year, but here Donovan truly lets the side down, with weak, breathy and even occasionally flat vocals and wobbly accent work that slips jarringly from Southern tang in dialogue to awfully proper British when singing. 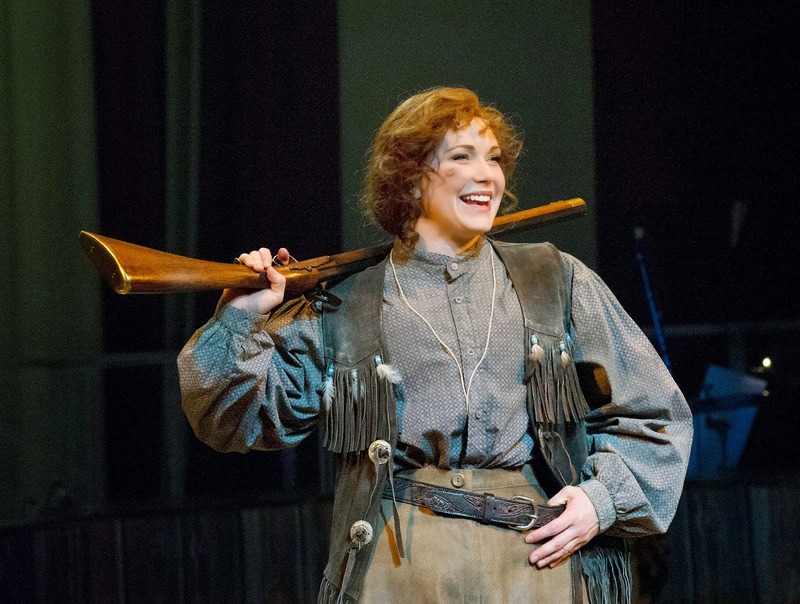 Whether or not Donovan is coasting, or there are more prescient reasons for such a woolly performance, is unclear, but it seems by default to make any recommendations for Annie Get Your Gun a Saturday experience, when Jonathan Wilkes performs the role in Donovan’s stead. Fortunately, steering the good ship Annie with far greater prowess and presence is it’s leading lady, Emma Williams. She’s the star of the show in every respect, and her confident, assured turn in the iconic role is undoubtedly the production’s biggest selling point. With vocals, accent and character work all faultlessly on-point throughout, she is an absolute delight, and commands the stage throughout with her vibrant, thoroughly likeable turn. Oakley herself is a strong, resolute yet in some ways vulnerable character, but many feminists would likely baulk at the fact that her core motivation and goal throughout the show is to win the affections of the mildly misogynistic and chauvinistic Frank. Fortunately, Williams is so winning and feisty in the role that even when the character is at her most hero-worshipping and needy of Frank, it is forgivable and difficult to not continue rooting for her. 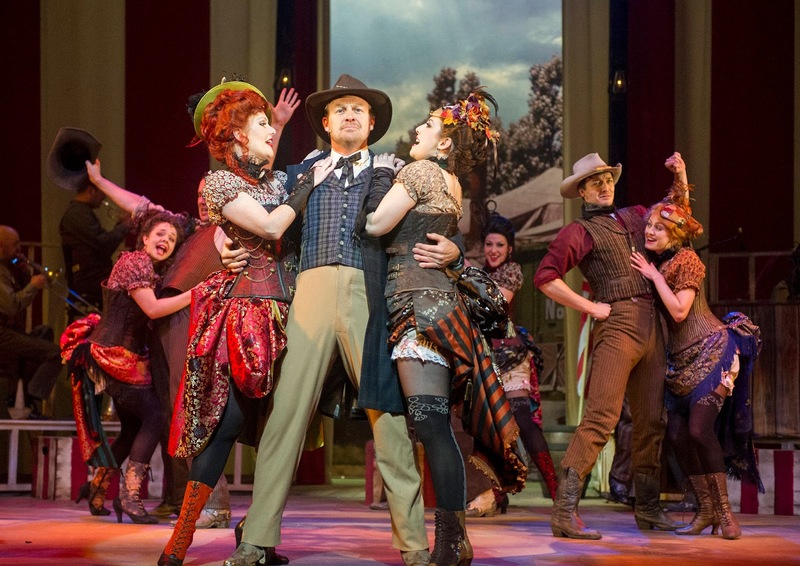 Annie Get Your Gun is a mixed bag of results for sure, and there’s certainly plenty of areas where the production could do with some re-invigoration and tweaking, not the least in finding a more fitting and enthused leading man. However, pushing Donovan’s non-performance aside, and some of the other criticisms mentioned (tighten everything up folks, and add some extra razzmatazz) this is still a faithful and buoyant revival of a genuine classic which can boast a quite wonderful central performance and a catalogue of musical theatre hits which are as enduring and beloved as they are for a very clear, and indeed audible, reason. 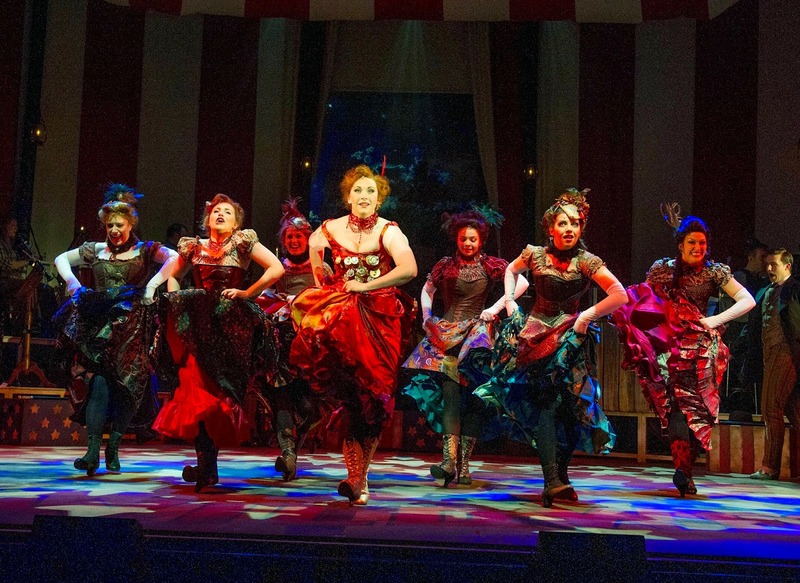 ANNIE GET YOUR GUN is running at the BIRMINGHAM NEW ALEXANDRA THEATRE from Tuesday 01 to Saturday 05 July 2014. CLICK HERE for more information on the show and to book your tickets! Alternatively telephone the New Alexandra Theatre’s booking line direct on 0844 871 3011. Press tickets for this performance of Annie Get Your Gun were provided courtesy of the New Alexandra Theatre directly. (A)musings Media gratefully acknowledges their generous invitation.